The Titan IVB/Centaur carrying the Cassini spacecraft and its attached Huygens probe stand at Cape Canaveral Air Station's Launch Complex 40, awaiting liftoff. 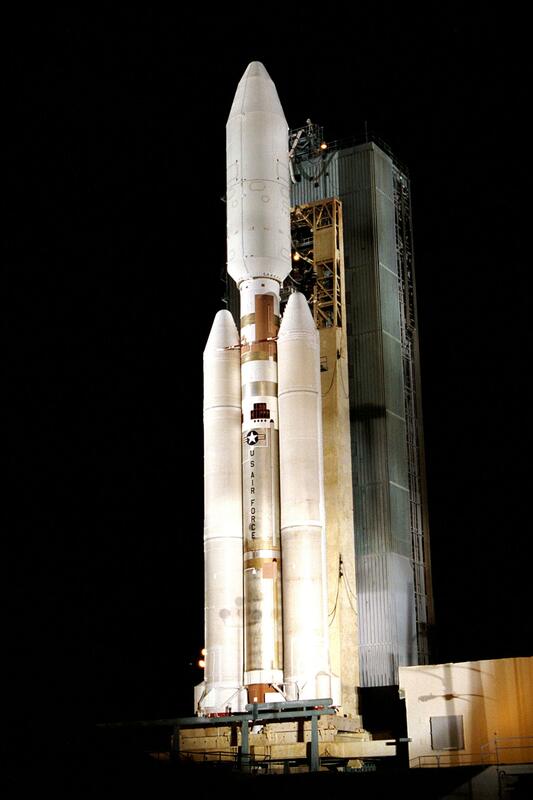 Clearly visible in this view are the 66-foot-tall, 17-foot-wide payload fairing atop the vehicle, in which Cassini and the attached Centaur stage are encased, the two-stage liquid propellant core vehicle, and the twin 112-foot long solid rocket motor upgrades (SRMUs) straddling the core vehicle. It is the SRMUs which ignite first to begin the launch sequence.